Earlier this week we have checked out the current status of Burst, an interesting altcoin that uses free HDD space for mining as well as started using SIA – a Blockchain-based cloud data storage service that has its own crypto currency token used to pay users sharing their free hard drive space (also mineable). So now it is time to share what we have earned or should earn for 5 days of mining Burst coins and sharing our free space using the Sia and also to compare to what we have earned as a rewards for testing the Storj DriveShare service that we have posted about yesterday. 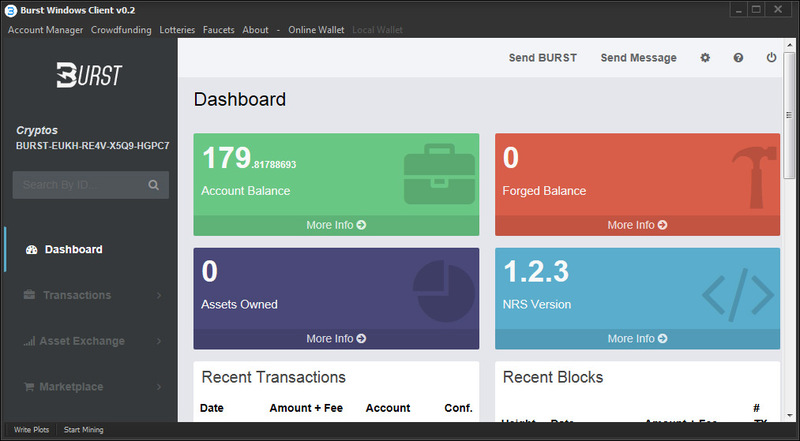 We are starting with Burst, for 5 days mining the coin with 100 GB plot size (rather small) in a mining pool we have managed to earn a little short of 180 Burst coins. These coins are immediately available in our wallet once they are confirmed, unlike with DriveShare where rewards are currently distributed on a monthly basis for the previous month and when the contract ends for hosing files on Sia. Looking at the current exchange rate for Burst is 19 satoshi per coin, so for 5 days this means we have managed to mine just about 3420 satoshi. An estimate for 20 days based on these earnings in order to be able to compare to the earnings from Storj means we should expect to mine the Burst coin alternative of about 13680 satoshi. Just as a comparison, for 20 days sharing the same 100 GB size of data on the DriveShare in the current beta we have earned as a reward a little over 12 SJCX coins or about 115000 satoshi. So even with the not so high rewards in the current Storj DriveShare beta you can earn more than mining Burst with the same shared free space. The catch with Storj however is that you need to invest in at least 10000 SJCX coins and have them in your wallet in order to be eligible for receiving rewards. Moving on to Sia that is similar to idea to Storj’s MetaDisk and DriveShare services, however unlike with Storj’s services Sia is already operational and you can purchase contracts ans share files or host files of other users and pay or get paid for your services. 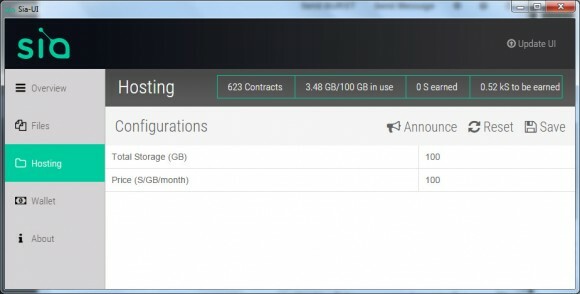 After 5 days of running the Sia wallet and client sharing 100 GB of free space on the network we are at an estimated 520 Sia coins to be earned once our current contracts are over. This is with a set price of 100 Sia coins per GB of space per month which is below the average usually floating in between 130-160 Sia coins per Gigabyte per month price that can even go up to about 200. The current price of Siacoin is about 7 satoshi or this means that when we fulfill our hosting contracts we would have earned 3640 satoshi for 5 fays or an estimate of about 14560 satoshi for 20 days in order to compare with the Storj rewards. The catch with Sia is that even though we are sharing 100 GB of free space for 5 days we have managed to get contracts for hosting only about 3.5 GB of user data. Interestingly enough with just 3.5 GB we have managed to get an estimated earnings of slightly more than when mining for Burst coins, but still significantly less than we have earned from Storj’s DriveShare beta rewards. IF we multiply the rewards for the 3.5 GB shared data to estimate what would the full 100 GB earn if we have sold the full size result in about 14872 Siacoins in earnings. That would mean that for 20 days if we managed to immediately sell the full 100 GB free space that we decided to dedicate to Sia we could have earned nearly 105000 satoshi. This would be significantly more than form Burst, but still lower than the DriveShare rewards estimated for the same time and with the same amount of free space shared. So it seems that Storj’s DriveShare beta service and the rewards that are being distributed for helping in testing and developing the service is more profitable at the current exchange rates and the potential for even more earnings s there once the service is ready for official launch. The drawback however is that you need to invest a significant amount in at least 1000 SJCX coins in order to be eligible for rewards. Also once again the service launches it may face the same problem as Sia at the moment – not enough users to quickly take up all of the offered free space by hosters. Sia has good potential to develop and compete with the likes of Storj, but it needs more users and needs to address some important things that we have covered in our initial impressions. The advantage that Sia has is that you are able to mine Siacoins in a more traditional way, however this also needs work as currently it is only solo mining and there are quite a few inconveniences present there as well. Very interesting comparison, thanks! I’ve been mining Burst since nearly day 1 now, and I completely agree with your statements: there’s a lot of functionality baked right in, and the coin has AT implemented, offering nearly limitless potential. Still, ease of use and varied audience are still lacking. Quite undervalued, but I don’t think it will be going up into the 100’s before some new developments happen. I already asked this question a week ago and still haven’t received an answer yet……..
I’d like to know what this “Storj MetaDisk & DriveShare” stuff is, because it sounds very confusing to me and even I as a Bitcoin and Mining expert don’t understand it. And I have read all the blog entries regarding this stuff here. It appears to me that this has nothing to do with cryptocurrencies and mining, it sounds more like a p2p or filesharing service with some storage space to upload files or whatever, so it shouldn’t be on this blog site. Again, what does this have to do with cryptocurrencies? And what the heck is SIA? Is this some of those new altcoins which you can mine with your harddrive? Storj is powered by Blockchain and uses crypto currency tokens, though they not mineable in a traditional way. Sia is similar to Storj in terms of an idea for a blockchain-based file sharing service, but with it you can also mine the crypto curency token Siacoins and is more like a traditional altcoin. With Sia you are actually mining coins with GPU miner, not the hard drive like you do with Burst for example. So long story short: Burst is the only coin that is truly mineable with free space. There is also a service Boxdrive.com. This is not mining crypto currency in the usual sense, but there is also earnings on HDD (due to sharing of free hard disk space).